High school and college students have a number of free apps available to help with chemistry class. After browsing the App Store I selected two periodic table apps that were free, high quality, and which seemed efficacious for learning. These selections can aid a student who is rehearsing the elements for an exam, or anybody who would like to be more familiar with the periodic table. This highly-rated memorization game for iPhone, iPod, and iPad is rather straightforward. In fact, Elements by MmpApps is little else than a multiple choice drill on the location of elements in the periodic table. But somehow it can become fun and addictive. Simple though the app is, the challenge of it sinks into the player. You are able to see your percentage score updated with every hit or miss. It is easy to get wrapped up in the desire to bat a high percentage. There also are bonus details that add to the experience of this learning game. In addition to a clean general appearance the developers have included nice graphics showing a sample of each element. For someone who benefits from flashcard-style drills, the app is ideal. The only complaint about Elements I can muster (aside from the ads, which in this app aren’t very obtrusive) is that this is all the game is: a flashcard drill. There isn’t a lot of creativity or art in the presentation. 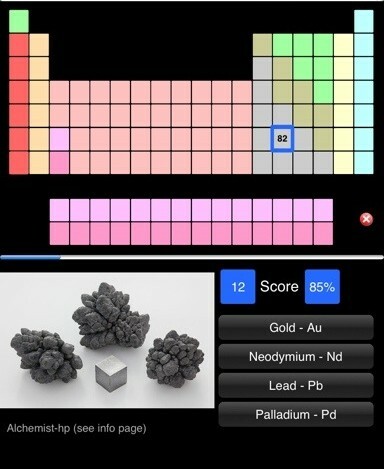 But it is simple and easy to use, and if you’re setting out to memorize the periodic table for chemistry class, or just want to become more familiar with the elements, this app will get the job done. And if you have some rockhound or armchair naturalist in you, you might enjoy looking at the slick pictures of elemental mineral specimens as much as I do. Oresome Elements by Intunity for iOS. This screenshot is considered to be fair use on the rationale that it is: 1) for the purpose of critique, 2) low resolution. A 2011 Australian Mobile Awards finalist, Oresome Elements was developed by Intunity and the Queensland Resources Council as a part of a program for the development of classroom technologies. Like Elements by MmpApps, it appears to be exclusive to Apple devices. 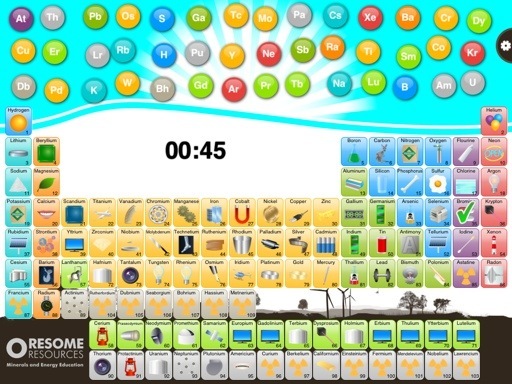 The game is played by dragging and dropping the elemental symbols onto their proper locations on the periodic table, creating a visible trail as the symbols slide down and across the screen to their destinations. Like other “trajectory” games, when two elements collide in transit, they fly back to their starting positions, so there is a gameplay element of spacial-skills strategy in addition to the basic task of locating the elements on the table. While the graphics and play are more developed, creative, and pleasing than Elements (above), I feel I have more criticism for Intunity’s app. Foremost, the periodic table displays the full name of the element. This makes it very easy to guess where many of the element symbols belong without actually memorizing where the elements are located. I don’t think it can hurt–it will certainly make a user more familiar with the layout of the periodic table, but it might not help very much with blind recall. Oresome Elements also, like MmpApps’ game, provides visual cues for the elements. However, in this case these take the form of tiny cartoon icons inlaid in the cells of the table, and frequently they seem to be stretching for an example. 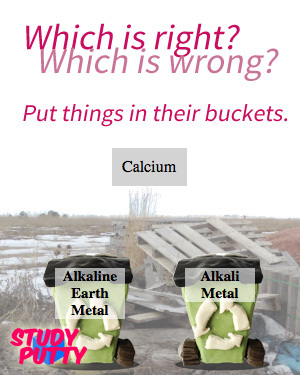 Calcium is represented by a smile. Many of the lanthanides are flatscreen monitors in which they must presumably be utilized, and most of the actinides and synthetic elements are simply represented by radioactive warning signs. I find myself a little bit disappointed with this stab at visual mnemonics. Finally, the panicked rush of drawing trajectories for the symbols to find their homes on the table takes precedence over actually memorizing the content of the table. By introducing a peripheral concern to gameplay, they have taken away from the educational value by shifting the focus to a spacial-motor type skill. 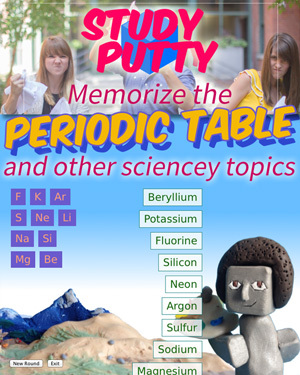 Because Oresome Elements doesn’t require much familiarity with the periodic table, a student might treat it as a beginner’s game made easy by having the full element names spelled out on the table. The student could then graduate to MmpApps’ Elements game, which I believe is a superior memorization tool. In any case, both are offered free in the App Store for iOS devices, so there’s nothing to lose for a student looking for some study help with intro-level chemistry. Despite my few complaints with Oresome Elements these are both free tools that are out there to do good, and they should be put to good use. Still looking for a way to memorize the chemical elements? 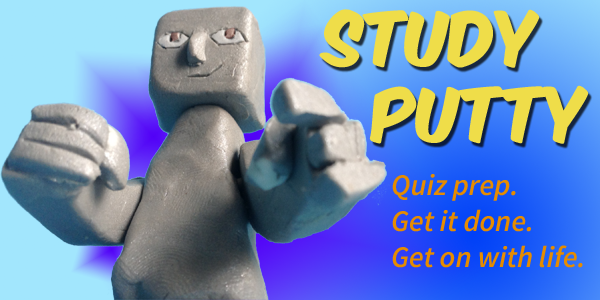 Try out Study Putty. Tagged activity, Chemistry, classroom technology, e-learning, educator resources, elearning, learning activities, Learning Technology, periodic table. Bookmark the permalink.